Tattoos are gradually becoming very popular. They last a lifetime unless they are surgically removed. They can be done in black and white, or multiple colors. 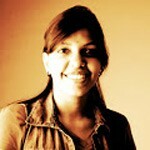 They may be designs or letters depending upon what the individual wants, or even symbols. 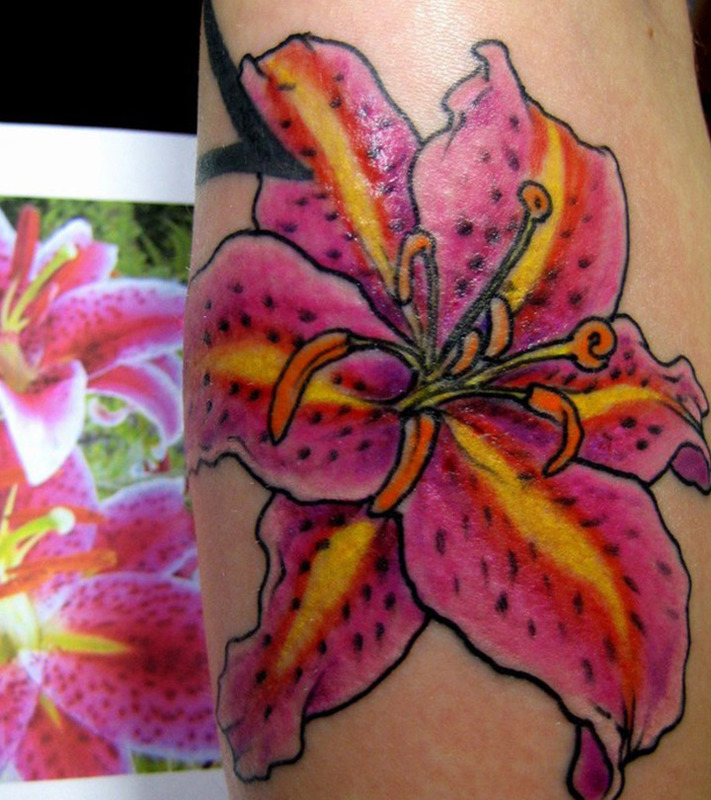 Lily tattoos are an emerging favorite with the ladies. 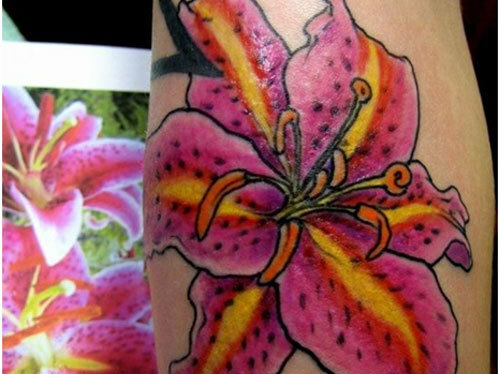 While men often emphasize their masculinity, lily flower tattoos are sported by women to highlight their feminine side. The designs vary from intricate artwork, to minimalist ones; symbolist creations to simple paintings recreated on the body. 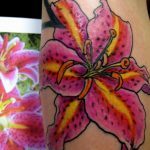 This tattoo shows a single large lily. The lily is baby pink in color with stripes down the middle of every petal. The stripes are colored orange with yellow and black freckles. The anthers of the lily are prominent and dark and the edges have orange buds making them look very pretty. The stem is in black ink. 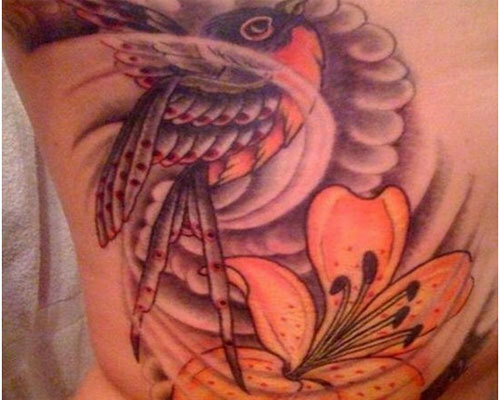 This is a very detailed and colorful tattoo. This tattoo is pretty unusual. It shows a reindeer with giant antlers. And twined around the antlers, are the lilies. The lilies are small and orange in color with prominent black anthers. 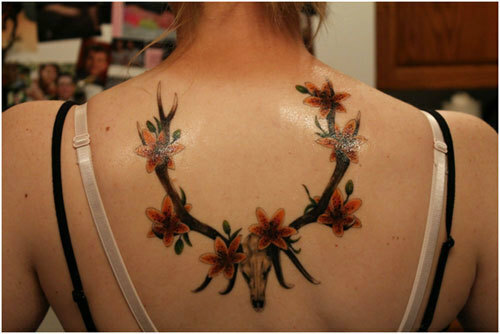 There are three lilies draped on each antler. Green buds of the lilies are interspersed. The antlers are brown in color, the reindeer is in beige. This tattoo is copied from a painting. It shows a peach coloured lily. The outline is done in black and highlighted in white. The anther is exposed and is yellow at the bulbous tip. A large blue and black butterfly is seen hovering over the lily which is suspended midway in the process of pollination. Below the larger lily is a smaller one whose side profile is drawn. 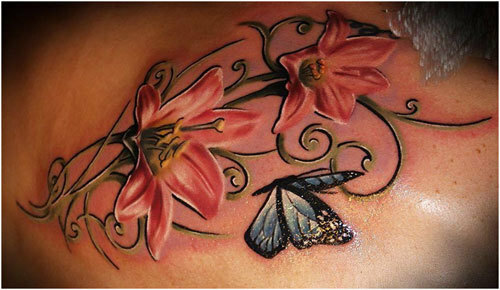 The lilies are surrounded by leaves which are painted in dull green and curled to look like ringlets around the tattoo. This tattoo shows two blue lilies. 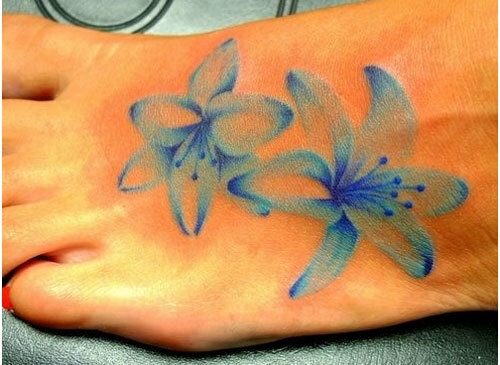 The lilies are tattooed entirely in blue ink. The outline is dark blue with the inside filled in with light blue ink. The anthers are done in indigo blue. The shading is also done in white to give it texture. This tattoo is symbolist in its approach. 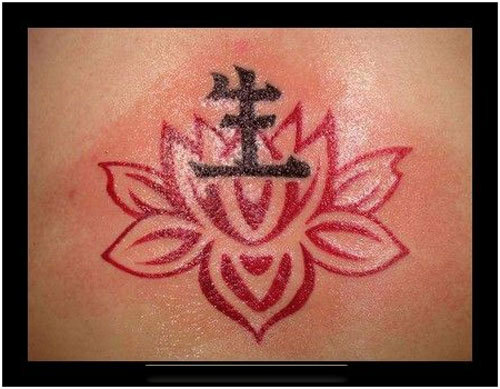 It shows the outline of a lily in the form of bold strokes and lines to make it look like an emblem. The lines of the lily are all done in a dull red. Over the red lily emblem is the Japanese character for a ‘water lily’. The Japanese character of the alphabet is tattooed in black. This tattoo is done is different colors. The lily is orange in color. The waves are shown in the form of ringlets, done in sky blue ink. There are two lilies. The one on top is plain orange in color. The one below has black spots over the orange. This tattoo is in black and white. 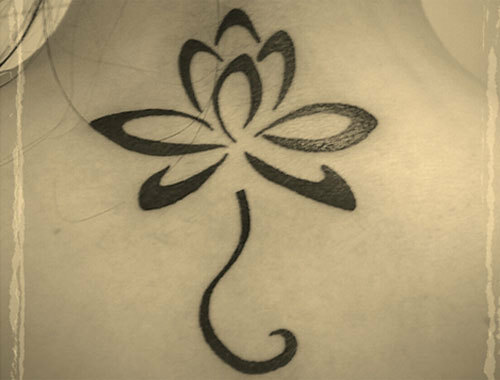 It shows the outline of a lily with the stem and its petals inked with black ink. The strokes are bold and beautiful. This tattoo is an outline in black. It shows dark pink lilies on a stem. The lilies have stripes that are done in black for texture. 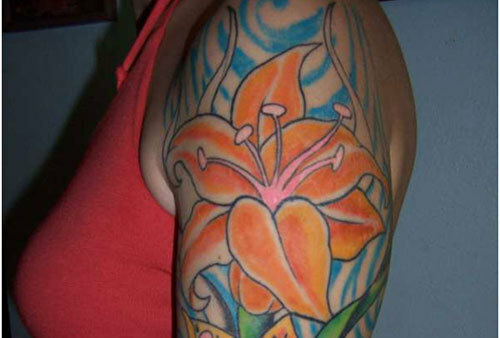 This tattoo shows a large orange lily. Over the lily is a hummingbird in muted shades. Behind the bird are clouds done in gray, and outlined in black. 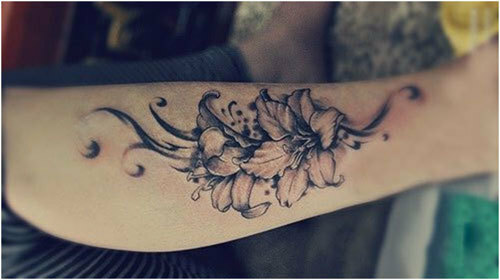 This tattoo shows a classic white lily. It shows a long stem and on it are two large white lilies. The white lilies have black specks on the petals. 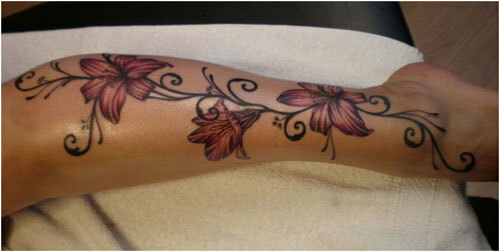 Your one stop for all tattoos with 300 floral tattoo ideas.